He has left the concrete jungle of London for the green and pleasant land of Salisbury, Wiltshire. 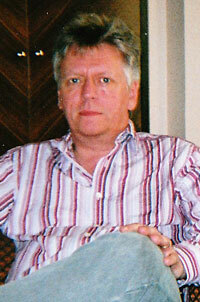 Paul is now the director and writer for a children’s puppet performance group called Tin Harlequin. He told me that forming the group “was a dream come true”. Their first show, Different Worlds, has hit the road performing in rural communities and at festivals throughout the SouthWest of England. It features six original tales that Paul has written with characters he has created. Paul says, “I bring a ‘pagan rock & roll surrealism’ to my work”. They are at the Totnes Festival on the 12 September 2010, as the opening act on that final day. 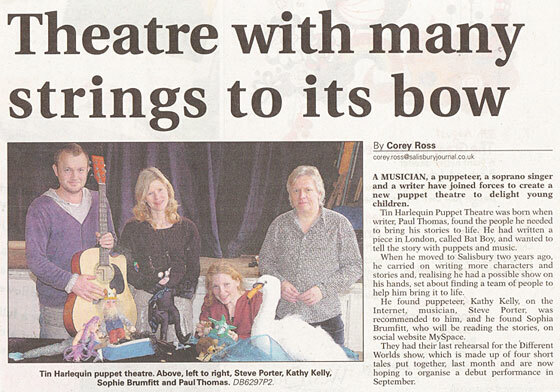 Newspaper cutting about the Tin Harlequin children's puppet performance group. The Scratch cartoon strip, first published in Animator mag , lives on. It has appeared weekly in the Salisbury Journal for the past two and a half years, with the 135th episode published this week. A Scratch cartoon strip from Animator mag Summer 1987. You can read more about Paul’s Tin Harlequin group on his myspace page where he has also assembled a gallery of pictures from his long and interesting career as an animator, writer and designer.